Want to teach someone how to work something on their computer? Or save streaming movies for local playback? Record cool gameplay tricks? No matter what your need, today’s discount software promotion fits the bill – it’s Joyoshare Screen Recorder for Windows! Joyoshare Screen Recorder for Windows is a screen recording tool that empowers you to record any desktop video or audio in high quality. With Joyoshare Screen Recorder for Windows, you’ll be able to capture anything that happens on your screen, whether it’s a game, application tutorial, streaming media, webcam footage, Skype call, and more! Best of all, Joyoshare Screen Recorder for Windows offers you a variety of options when it comes to recording. Capture the entire screen or just a portion of it. Save your capture off to one of a number of popular file formats, including HD MP4, AVI, FLV, SWF, WMV, MKV, MOV, and other common formats as well as to formats specifically for popular devices like iPhone, Android, Xbox, and smart TVs. 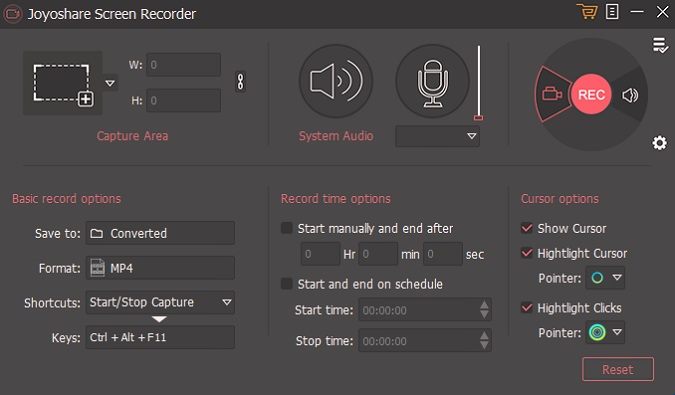 You can even schedule recordings in advance, so you don’t even have to be in front of your computer when Joyoshare Screen Recorder for Windows goes to work! After you purchase Joyoshare Screen Recorder for Windows it may be used indefinitely. Joyoshare Screen Recorder for Windows is licensed per user, so if more people are going to use Joyoshare Screen Recorder for Windows you will need to purchase additional copies. Frank Christensen After purchase, Chrome blocks the d/l as dangerous. Downloaded the trial from the link in BdJ's email, Chrome says dangerous and won't d/l. Downloaded the trial from their website but it says the registration code is invalid. Scanned the trial d/l and Avast and Malwarebytes both say it's OK. The registration code is being rejected by the software program. What's going on? Also, I am using my own email address (associated with BDJ) as the one I enter into the program, so why is the BDJ-assigned registration code invalid? Please fix this error so I may successfully register the program. Thank you. Haim User me too: Kaspersky shows malware/virus and purges the file. ???? Constantin Florea The registration code is working, you just need to ensure that you are using the installer from the receipt email because that one is different from the one on the product website. Foto User Constatin, could you maybe zip that file, so chrome doesn't recognize it as exe? Foto User Never mind, I used a different browser, downloaded, installed and opened it. Now I know W10 shows a different shade of bsod! Take heed of those warning signals! Jeff User Your software really looks interesting, but you'll want to find a way to wrap the file so that Chrome users can effortlessly download it without having the download blocked. I don't even have an option to bypass the warning...it's not downloadable, if that helps you to understand the full impact of what I'm saying. franp User Same problem here with Firefox. Download fails at the last bit probably due to anti-malware blocking. Doris Ballard I used the link provided in the email, and when the program had installed, I carefully input my email address, and cut/pasted the registration code. It told me the code was invalid. That made me wonder if I had used the wrong link ... so I went back to the BJD page, and overwrote the program using Constantin's lnk. It was still invalid. That made me wonder if the problem was that I'd overwritten the program, so I started all over again, this time by first uninstalling the program, then using the email link, uninstalling it again since it didn't work, and using Constantine's link ... it simply will not allow me to use the registration. Would really love to have this program if I can have some help getting it to accept the installation. Antoosa Constantin, Please address my concern about the registration code and email address not being accepted by the program. I successfully installed the program, but registration code and email address are not recognized. I hope you get back to me on this matter. Thank you much. David Mescheloff Hi, Constantin! Can you solve the problem of Chrome refusing to download the program, and keep this deal on a day longer? Disabling Chrome's protection doesn't seem to me to be a proper way to go about this - it's just using brute force, which I don't like. Frank Christensen Constantin, thanks for your work behind the scenes trying to resolve this (and many other) problems, we understand it must be a real headache. We think it might be a malicious, unwanted, or uncommon file. Uncommon: You tried downloading an unfamiliar and potentially dangerous piece of software. We've found that the website you tried to download the file from has been known to distribute malware." While BdJ shows it scans clean, the difference btwn BdJ and Chome's analysis is troubling. To help protect users, Google maintains a list of websites that are known to host malicious downloads and a list of trusted software publishers. If you're a software publisher and your binaries are flagged by Chrome, learn how to resolve malware or unwanted software issues related to your downloads." Frank Christensen All: This program downloads and checks out ok with Edge, installs and registers properly. Peter Ekkerman Hi. I used Slimjet (Chrome based) to download. No problems and registration successful. My problems are with the program itself. No easy way to cancel screen size selection. What's worse - the program is only partially multimonitor aware. No way to select monitor to take screencapture. Roderick Card tried to download, each time no date. I see a note that because the program is limited to one download which appears to be the root of the cause. Skip this one and note a major BitsDuJour issue starting with the blocked Chrome download which precluded any subsequent d/l. soo mi A question for the Joyoshare team / product manager: When your software is used to record a streaming video or webinar, does it record the video: (1) at the resolution that is being transmitted from the originating server, via the web; (2) being recorded at whatever the monitor being used is set to display; or (3) is it being recorded at the standard 72 DPI default of many monitors? I like the looks and features of your software, as you (and Constantin) have described them, but I can't find any reference to the quality at which a video is actually recorded, other than your statements that your software "empowers you to record any desktop video or audio in high quality." Even on your website, under the Technical Spec's section, you mention both "4K UHD Videos" and "4K UHD Encoding" as accepted inputs, but you do not mention in the output block if the incoming resolutions are maintained (the only reference you make is to "HD Videos" formats that captured can be saved in). This may seem a bit picky, but, if I "capture" a high-quality, enhanced format video, I would also like to know that the saved format will be the same as the input format. Thanks. Constantin Florea It's no unusual for some antivirus systems to show false positives for an installer. We use virustotal.com to scan the downloads and for this one there are 0 detections (out of 67 scanners). If it doesn't work downloading the installer with Chrome, please consider using Edge, Opera or Firefox to download the file. Constantin Florea @O. J., You can use any email address you want. Antoosa Constantin, I did as you advised. Still no success. Sent you email. Thanks. Constantin Florea @Antoosa, I replied. O. J. It will not let me download from the e-mail receipt button or link. It blocks the download. What can I do? Joe User Download, installation and validation working 100% - thanks a lot. Frank Christensen O. J., use another browser and copy the link (right-click) in the email and paste it in the non-Chrome browser. Edge worked fine for me. K James AVG says the program installer has a virus/malware and won't let me save it via Firefox. K James Okay, never mind. I selected to let it download the installer and the AVG program had a pop up window in the lower-right corner saying its signature was untrustrowrthy. But after I manually scanned the program with AVG, it said no virus or malware was found and then the warning in the popup went from red to green. So I went ahead and installed it and it registered just fine after that. I'll rescan my machine with a few different checkers to make sure before I reboot my machine. O. J. Thanks, everything worked alright and the installation and registration went as it should so I appreciate your help and thank you so much.